March 2, 2016 (San Diego, CA) - Slightly Stoopid have unveiled the initial dates for their 11th annual summer tour. The 2017 Sounds of Summer tour will route the California natives to amphitheaters and pavilions across North America and take the band overseas for festivals throughout Europe. 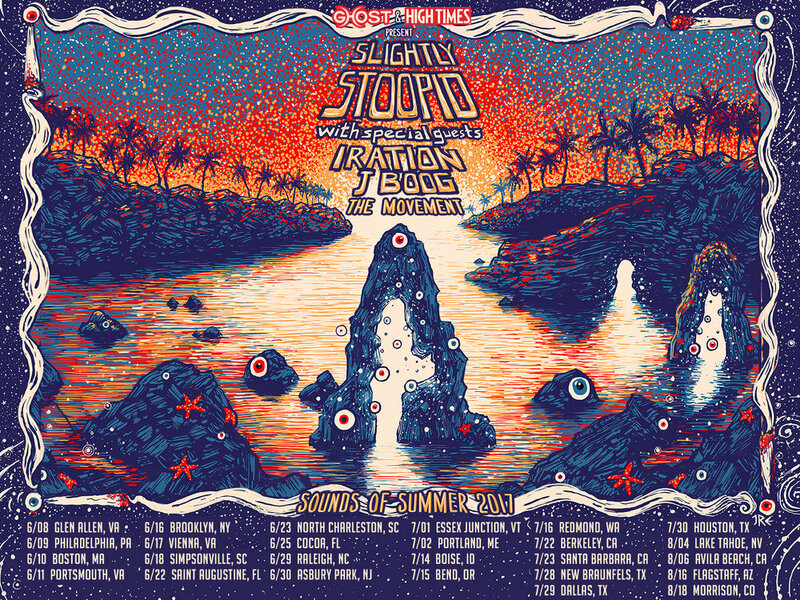 Joining Slightly Stoopid on all June, July and August US dates are Iration, J Boog, and The Movement. Pre-sale tickets go on sale at 12 PM local time this Friday, March 3rd through the Slightly Stoopid fan club. The general public on-sale will then take place at Friday, March 10th at 10 AM local time. "It's gonna be a summer of madness when we the hit the road with our boys Iration, J Boog, and The Movement for the Sounds Of Summer 2017 tour," says frontman Miles Doughty. "Smokestacks and sunshine while spending the summer jamming, BBQ-ing, and hanging with friends. Doesn't get much better than that!" The Sounds of Summer tour kicks off in Glen Allen, Va on June 8th and carries the band along the East Coast through July 9th. Slightly Stoopid will then hit the Pacific Northwest for about a week before traveling towards the southern edge of the country. Announced are 27 dates and 19 states in all including a return stop to Red Rocks Amphitheater in Morrison, CO as well as Marymoor Park in WA and The Greek Theatre in Berkeley, CA. More dates will be announced soon. A full list of currently announced tour dates are below. Be sure to catch Slightly Stoopid at festivals worldwide this spring and summer. Currently announced performances include appearances at US festivals Reggae Rise Up (St. Petersburg, FL), Tortuga Music Festival (Ft. Lauderdale, FL) and SweetWater 420 Fest (Atlanta, GA), and internationally at Jungle Jam (Jacó, Costa Rica), Byron Bay Bluesfest (Byron Bay, Australia), and Boomtown (Winchester, UK). 2nd annual Okeechobee Music and Arts Festival is now SOLD OUT!